[152 Pages Report] The global high throughput process development market is expected to reach USD 415.5 Million in 2021 from USD 162.9 Million in 2015, at a CAGR of 14.4% during the forecast period. The base year considered for the study is 2015, and the forecast for the market size is provided for the period between 2016 and 2021. In the current market scenario, there is a growing demand for high throughput process development products. Growth in the global market is mainly driven by the increasing R&D spending, technological advancements in process development, growth in the biopharmaceutical industry, and growing pressure to lower the cost of manufacturing. However, factors such as the high cost of technology and equipment in this market and lack of adequate infrastructural facilities are restraining the growth of this market to a certain extent. Top-down and bottom-up approaches were used to validate the size of the global high throughput process development market and estimate the size of various other dependent submarkets. Major players in the market were identified through secondary research and their market revenues were determined through primary and secondary research. Secondary research included the study of the annual and financial reports of top market players, whereas primary research included extensive interviews with key opinion leaders such as CEOs, directors, and marketing executives. The percentage splits, shares, and breakdowns of the segments were determined using secondary sources and verified through primary sources. This data is consolidated and added to detailed inputs and analysis from MarketsandMarkets and presented in this report. The high throughput process development market is highly competitive. Some of the major players in this market are Danaher (US), GE Healthcare (US), Agilent Technologies (US), Merck Millipore (Germany), and Thermo Fisher Scientific (US). The global high throughput process development market is expected to reach USD 415.5 Million in 2021 from USD 212.1 Million in 2016, at a CAGR of 14.4% from 2016 to 2021. Growth in this market is mainly driven by the increasing R&D spending, technological advancements in process development, growth in the biopharmaceutical industry, and growing pressure to lower the cost of manufacturing. However, factors such as the high cost of technology and equipment in this market and the lack of adequate infrastructural facilities are restraining the growth of this market to a certain extent. 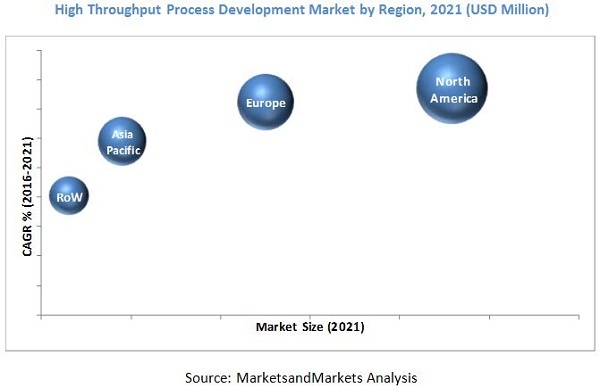 The high throughput process development market is segmented on the basis of molecule type, end user, technology, product and service, and region. Based on molecule type, the market is classified into monoclonal antibodies and others (recombinant pro-insulin, polysaccharide vaccines, recombinant Green Fluorescent Protein (rGFP), fusion proteins, and interferon á-2a). The monoclonal antibodies segment accounted for the largest share of the global market in 2016. The large share of this segment is attributed to the increasing adoption of targeted immunotherapy and rising number of US FDA-cleared therapeutic monoclonal antibodies. Based on product and service, the market is categorized into consumables, instruments, services, and software. The consumables segment accounted for the largest share of the global high throughput process development market in 2016. The availability of a wide range of reagents and continuous product developments and innovations are expected to drive the HTPD consumables market. Factors such as the high cost of technology and equipment in this market and the lack of adequate infrastructural facilities are restraining the growth of this market to a certain extent.